The subject may be a move away from the d’artiste series’ staples of concept art and matte painting, but there’s plenty in Ballistic’s latest book to appeal to games and film artists, says Fernando Caire. Personally, I never found fashion design too appealing. That’s just a personal preference, but when I was given a copy of the latest in Ballistic Publishing’s long-running series of art masterclass books, I did wonder if I was up to the task of reviewing it. Fortunately for me – and for others like me – d’artiste: Fashion Design tackles the subject from a broader perspective. Covering fashion design for games, film, and animation, this latest book is loaded with useful techniques for readers of all backgrounds. Four artists are featured in the book, and not one of them fails to impress. Alongside their tutorials, each is given a few pages to show off their personal work and give some insight into their design process. The results are so distinctive, and their styles so diverse, it would be impossible to confuse one with the others. Equally importantly, their tutorials are easy to follow. Alessia Zambonin provides some in-depth walkthroughs on illustrating cloth, particularly providing adequate textures for it. Her tutorial on completing an entire character as well as the background is also very impressive. She gives thorough instructions on background elements, attention to detail and atmosphere. Though her work, at times, is a bit dark for my taste (no, not as in subject matter: it is literally too dark), these proved to be very helpful. It’s also the only tutorial in the book centered around a male character. Annie Stegg’s section of the book is interesting in that she shares her personal experiences on working in games and television production – her clients include Hi-Rez Studios and Tiki Games. In addition, her tutorials are written in collaboration with fellow artist Anne Pogoda: useful, since most artists will have to work on teams at some point in their careers. Their walkthroughs show how much working with other artists can help to move the design process along, and the results feel far more like portraits than the other tutorials in the book. 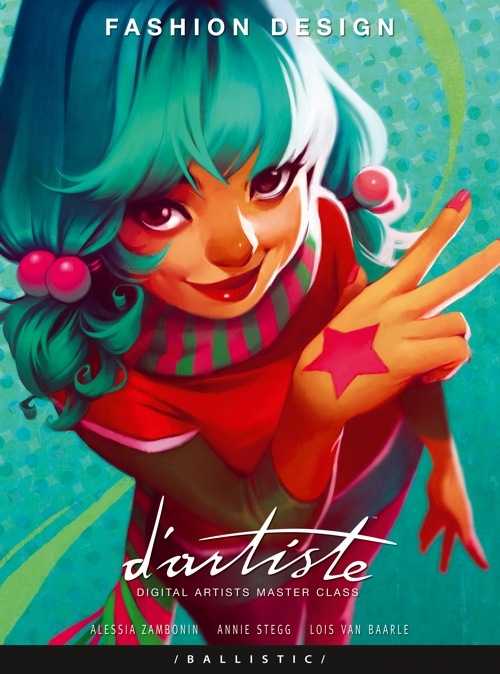 Last, but certainly not least, is Lois Van Baarle – or as she is better known to her online fandom, Loish. If you are not already a fan of her deviantART page… well, you are now. Her vivid color schemes, along with some lush and creative designs, make her work the highlight of this book. Her tutorials cover form, gesture, lighting – and, of course, color – setting out her technique from thumbnail sketches all the way to the final illustration. Her style has a curvy and flirtatious feel to it, yet they the results never become too exotic. For lack of a better word, her illustrations are very, well, bubbly. Yet they are not without depth and substance. Being a long time fan of her illustrative style, getting insight into her techniques is a real treat. d’artiste: Fashion Design is the perfect reference for those of us who are not fashion designers. Offering a new perspective on the creative process through these four renowned artists, the book is a must-have for anyone who needs to brush up on their fashion design techniques – especially if you happen to be a fan of Loish. d’artiste: Fashion Design is available now from Ballistic Publishing’s web store in slipcased or deluxe limited editions, price $75 and $170 respectively, and from major online book stores.